Optimizing your web pages, blog posts and articles increases the visibility of your website on search engines for people who are entering keywords associated with your product or service or related to your content. This can also help web publishers increase web page traffic for a higher ranking in search engines and to increase the no. of readers. Simply stuffing random keywords into your article will make the words look forced and out of place. This will not get your page the traffic it needs. It is important that your words target keywords appear in your article naturally. You must research and understand the keywords and phrases that your target market is looking for and then add them to your article accordingly. Adding Meta descriptions to posts plays a major role in search engine ranking. Meta description works like a sales copy for a blog post that explains what your post is about. In just a few words, your meta-description should include your keywords and give a description good enough to attract readers to click on your site or article. Google checks the relevance of your description to your article content and then compares it to what the users are looking for. Based on user search queries, Google may alter your meta-description accordingly. It is not enough to randomly add target keywords to the article. You must add your keywords strategically in the right places for them to create an impact. Besides the title and the meta-description, your keywords should also be visible in the first 300 words of your article, as well as once in every 200-300 subsequent words. Targeting specific keywords will make your article more relevant and will help improve your ranking on the search engine. Creating a short, eye-catching, self-explanatory headline is as important as creating good content. Your headline decides if readers will continue going through your article or leave the site immediately. The headline should be good enough to attract the reader’s attention, prompt them to click on your article and continue reading it. Even if your content was Search Engine Optimized while posting, it should still be monitored using Google Analytics regularly. This will help you monitor your time on site, bounce rate, and pages per session. It will also help you pick the appropriate keywords required to optimize your page. A review of your bounce rates will help you understand why visitors are not staying long enough to finish your articles and also the changes you should make to provide them with what they are looking for. It will also help you pick the appropriate keywords required to optimize your page. Monitoring your analytics can also help you see how and from where readers appear on your landing pages as well from which page they chose to exit, helping you decide which page needs to be made more interesting to keep readers engaged longer. Search engines cannot recognize normal images and only identify images with alt text. The image’s alt tag tells the search engine what the image is about and the function of the image on the page. There is no need for title and description as long as correct alt-tags are used. Adding your keyword to your alt text will make it more noticeable to search engines and appear relevant to your content. Attaching links to more in-depth guides and articles on your site can help keep readers engaged for longer. You can also attach links to posts and articles that you have written earlier. Internal linking not only helps keep visitors on your page, but it also increases the visibility of other relevant pages written by you to search engines. However, anchor text and a link should be relevant to each other. The anchor text should not be your target keyword but should explain the content in the best manner. Besides attaching internal links, you can also add hyperlinks to other websites and posts with content similar to yours. This shows search engines that your content is useful, relevant and related to other accessible content on similar topics. Attaching links to non-competing pages and posts can indirectly improve the visibility of your posts and articles by attracting social shares, comments, leads, clients, and sales. You can also add nofollow link attribute to all the external links you’ve added in your content. While quality content is one of the best ways to get organic views for your articles, posts, blogs, and websites, these are a few ways that can be of additional help. 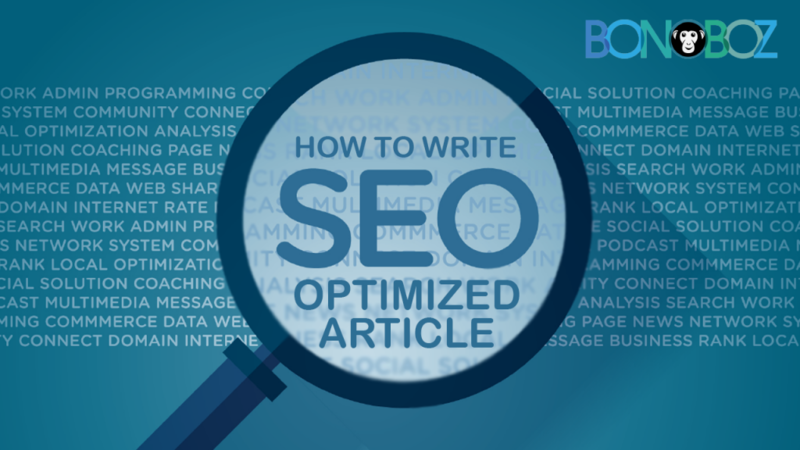 Writing articles that are already optimized for search engines can help improve your visibility and ranking because SEO Optimized article help drive traffic to your website. If the technical aspects of writing feel like too much of a jargon for you, contact us for help on making your content more noticeable to search engines.